I always enjoy reading posts like this and seeing what products my blogger friends are using. I wanted to share with you some of my favorite products from this year. I have joined forces with my friend Ashley from the Mixed Bag for a 2015 Favorites giveaway, where we are giving one lucky reader some of our favorite things! 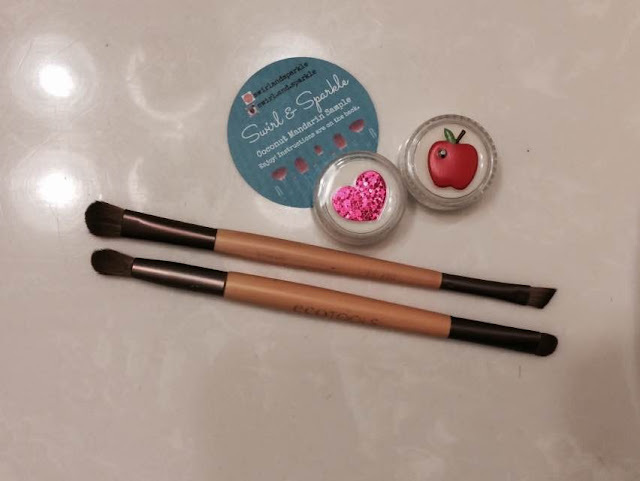 I have recently began buying makeup brushes, as I had previously just been using the brushes and eye applicators that came with the makeup palettes. After receiving an EcoTools Mattifying brush in an Influenster Box, I decided I needed to purchase some additional brushes. 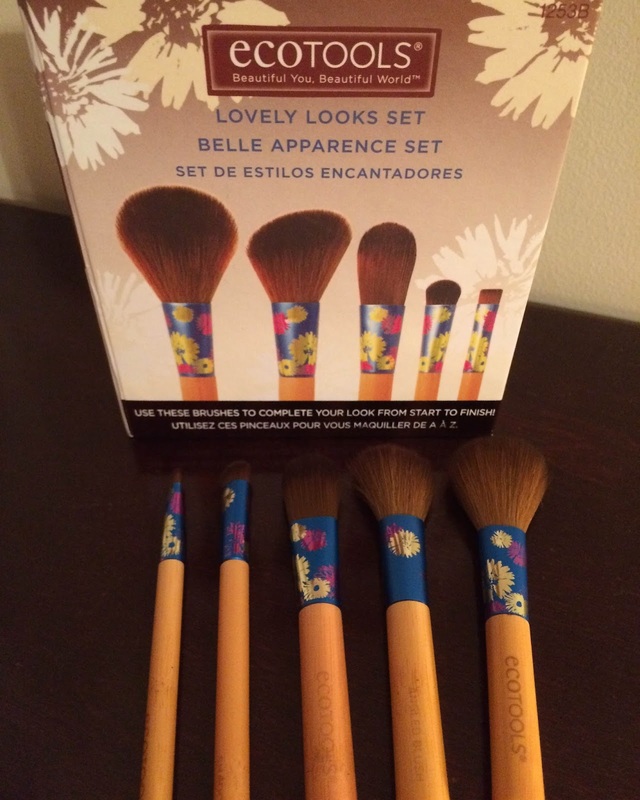 I have recently purchased the Lovely Looks Brush set by EcoTools at TJMaxx. These brushes are so pretty with their floral design, but they are also made with extremely soft, cruelty-free bristles. The set comes with five brushes: a foundation brush with flat sides, an angled blush brush, a fluffy powder brush, a wide eye shadow brush, and a flat eyeliner brush that gives a precise line. I have mostly been using the angled brush for my blush and bronzer and the two eye shadow brushes. The definer brush works great for when I want to use eye shadow as a liner. My next favorite product is something to clean my brushes with. I found out about Swirl and Sparkle from Instagram. Several beauty accounts that I follow were raving about this new brand of makeup brush cleansers that boasts of a very unique cleaning method that effectively cleans your brushes in just a few swirls; they use diamonds...well, acrylic ones! They are also handmade and hand poured and are offered in a Vegan Shea butter or Goats Milk cleanser. They were having a promotion so I took advantage and purchased two mini samples in toasted marshmallow and coconut mandarin. The cleansers smell so good and get your brushes squeaky clean in minutes! If you follow me on Instagram, you know I rarely have naked nails. I either have them painted or am sporting Jamberry nail wraps. One of my favorite nail polish brands is SinfulColors. You can find it at any drugstore for around $2 a bottle! They offer a wide variety of colors and usually come out with limited edition collections each season. They also come in many finishes such as cream, shimmer, glitter, and matte. I love all the bright and funky colors that you cannot always find in other brands. This polish also lasts pretty long for it to be so inexpensive and they have recently added a 2-step Gel Tech set to their line. This brand is also fun to follow on social media because they are always posting DIY nail art to inspire you and having giveaways! I am a fan of neutral color lipsticks and here are my top three that have been getting the most wear lately. NYC Expert Last in Sugar Plum, Rimmel Lasting Finish by Kate in #17, and e.l.f. Moisturizing lipstick in Marsala Blush. The NYC is my new favorite because it goes on creamy and does not dry out on my lips. The e.l.f. and the Rimmel are both long lasting, but have a matte finish so I sometimes layer a clear gloss over them. I hope you enjoyed my list! Are any of these your favorite products? If not, let me know in the comments what products you have been loving this year. Our Beauty Favorites of 2015 with The Mixed Bag & Real Girl's Realm! No way! I had a similar post in the works - now, if only I could get my stuff together and post it, lol. I'm going to have to try these brush cleaners you mentioned! I don't have one but need something! I will recommend the Milani matte lipsticks to you - preferably the one with Naked in the name lol. 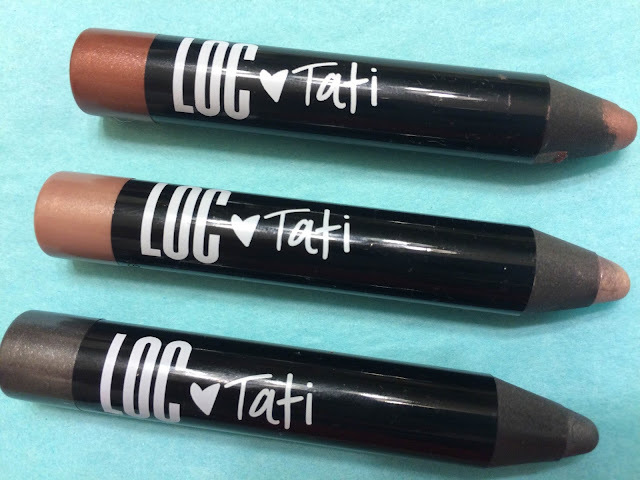 Or probably any of their matte nudes! They are fabulous!!! Ha! Really?! I love reading these kinds of posts to find new products to try! I will have to look for the Milani matte lipsticks. I do not own anything from that brand, but see it all over IG and I know its an affordable drugstore brand. I cannot wait to see what your favorite things are! I love ECO Tools! I've gone cruelty free with my cosmetics for the past 2 years and those are great brushes. I am such a makeup junkie, so these types of posts are so helpful! Thank you so much for taking the time to read and comment!! I love these kind of posts too! Merry Christmas!!! Such an exciting giveaway 😁 I never realized you had a blog until now or I would have subscribed ages ago! Awwww you are too sweet girl! My blog is actually pretty new. I have only really been promoting it the last few months. Thanks so much for reading and commenting and Good Luck on the giveaway! I have loved my philosophy cleanser this year! I have not tried any of the Philosophy products yet but have heard great things about them! My favorite beauty product os 2015 is physicians formula power foundation. I have friends that rave about physicians formula products too, so this will be a brand I try in 2016! Thanks for your comment! Good luck to you! I cannot believe I've never heard of the Swirl and Sparkle Brush Cleaner! I'm definitely going to have to give it a try! Amy, I know! I have been seeing it all over IG, so I had to check it out! They come in several sizes and a ton of scents and designs. You should check it out! Lovely Giveaway! I'm so glad I was able to find your blog through the link up! can't wait to read more! Thanks for checking out my blog and Good luck to you on the giveaway! Those brushes are so pretty! I'd heard so many good things about the ecotools sets. Thanks for doing this giveaway! Thanks for reading! I love the ecotools brushes, I have several of them and they are great quality! Good Luck! My fave thing from 2015 was Micellar Water. Yes! I love Micellar water too! I have been using the Simple brand, but recently discovered the Garnier too! My fave beauty product for 2015 is probably my e.l.f. matte lip color in Wine. At first I thought the color was too dark for me but now I'm really into these deep reds! Thanks for stopping by and commenting! 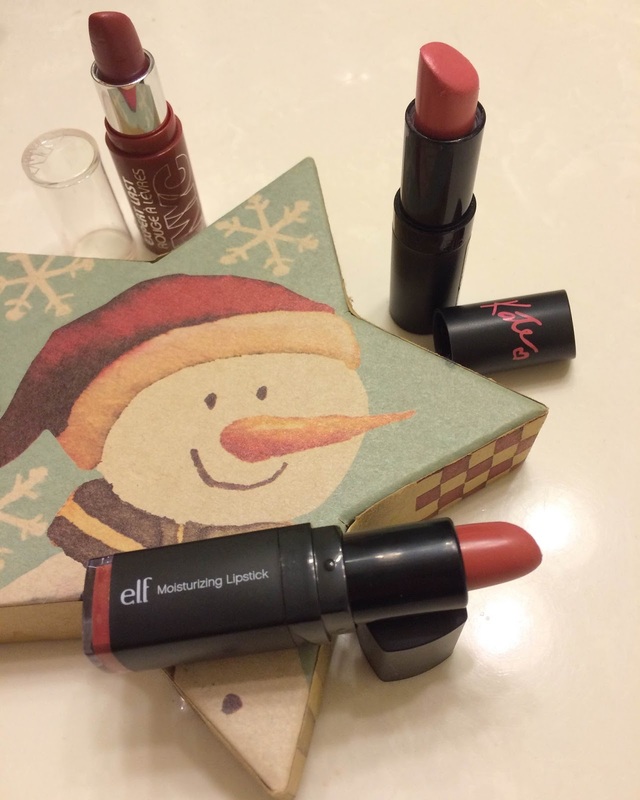 I love elf lip color, though I am not sure about the matte trend yet because I feel it makes my lips look dry. I wish you good luck! Thanks for sharing at Waiting on...Wednesday! Hope you'll join us again tomorrow! Thank you for hosting Waiting on..Wednesday! I really enjoy that party so I will try to join each week. Thank you for taking the time to check out my post and comment as well! I just bought on this year too and love it! Thanks for commenting!